Over the past ten years marketers have searched for the answer to a fundamental question. How do the successful marketers and online guru’s get to the top of their profession? How do they continue to have success after success with every product they release? Now I’m not talking about traffic, we all know having a successful list is really important, but many people have a great list, but still struggle to reach the dizzy heights the top marketers and guru’s reach. There is one thing however that all these people have in common, and that’s authority, and they have it in abundance. This authority has cost them thousands of dollars over many years, and we realize not everyone has this kind of financial clout or even the time to get to where they want to be. They want it now and they want it as cost effective as possible. 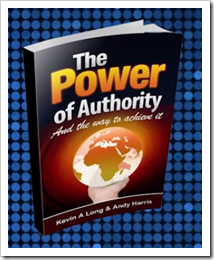 Introducing “The Power of Authority” One of the easiest ways to gain authority in any niche is to become a bestselling author, think about this for one moment. When you want to find information about anything, the first place you turn to is the internet, even before the internet you would search a library. This is because since the dawn of time, authors have been seen to have Authority, hence the word author. You shouldn’t underestimate, the power authority gives you, here’s a quick example. The last time you went to a hospital and sat waiting for someone to come and see you, what would you do, if a man or woman in a white coat came into your cubical and told you that you needed to take some form of medication? Would you ask them for identification, or would you naturally presume they were an authority, due to the white coat? You would say thanks and take the meds. This isn’t due to real authority, although they do have it, this is due to perceived authority, and also applies to bestselling authors. Kevin Long, aka the Kindle king, along with his partner Andy Harris, have produced a product that will get you to bestselling status on Amazon, even if you have never written a book before. Not only will it get you to bestselling status, but it will get you there in just 30 days. So the next time someone is looking for an answer to a specific question in your niche, where are they going to look? They are going to look at the bestselling author. Imagine what it would be like for prospects to come looking for you, instead of you having to search for them. THE POWER of AUTHORITY book was number 1 in Japan, USA, Germany, Brazil, Australia, and Canada and the product got there by using this very system that they are launching. A step by step guide, over the shoulder, that will give you the opportunity to be the authority in your niche. Alex Jefferys said “this product is outstanding” as it took his two books to number one around the World.